While previous Castlevania games expanded beyond the walls of Dracula’s castle into the Transylvanian countryside, Bloodlines tracks a map across Europe. 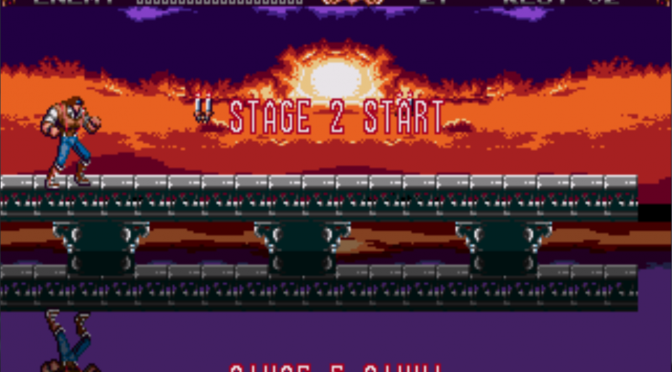 Later stages in the game include the Leaning Tower of Pisa and a German munitions factory, but today’s theme comes from Stage 2: the Atlantis Shrine. While the theme of the first stage, Dracula’s abandoned castle, goes for a fairly traditional driving Castlevania tune, Sinking Old Sanctuary feel immediately different. You can tell from the opening notes that composer Michiru Yamane (a top class composer who would work on the majority of Castlevania soundtracks from Symphony of the Night onward) was trying to evoke as much of an echoey, mysterious vibe as the grungy Genesis could muster. The track has no drums, opting instead for a consistent piano-y twinkling effect and a contemplative bassline. Much of the stage has you jumping between the outcroppings of sunken pillars and statues, or manoeuvring around the changing water levels. All of it lends to a sense of ruined majesty, of a grand society washed away by the waves. Aside from the incredibly moody Super Castlevania IV(a soundtrack I will definitely gush about on here eventually), Castlevania wouldn’t get many opportunities to deviate from the power-rock action game tone until Symphony of the Night shifted gears for the series. This makes Sinking Old Sanctuary a bit of an oddity, and one that I really dig. The track wouldn’t see nearly as many reprises in later games as the likes of Beginnings or Simon’s Theme, but it did show up a couple more times. Oddly, both instances are in games that Yamane didn’t work on. First comes the theme of the Art Tower from Castlevania: Legacy of Darkness, arranged by composer Masahiko Kimura. I haven’t played much of this game myself, but I feel like this arrangement is probably very fitting for an area called the Art Tower. This version of the song is much more slow and stately than original, the better to fit the pacing of a more exploratory game from awkward early 3D days rather than a snappy, arcadey Genesis game. The deep, slow, doleful drums help lend the track a mournful, almost dirge-like quality, and the ambiguous Genesis twinkling instrument has been upgraded to a wistful piano that comes and goes throughout the track. The bridge now being a delicate flute performance, as well as a number of other orchestral embellishments make for a much more dramatic track overall. The final occurrence of Sinking Old Sanctuary comes from Castlevania: Circle of the Moon, arranged by composers Sotaro Tojima, Hiroshi Mitsuoka, and Taro Kudou. This version is faster than the others, and probably the most action-y out of all of them. Besides the boosted tempo and the bass being much more prominent, the composition is probably about as accurate to the Genesis version as the poor GBA sound chip could handle. It is a much longer and fuller version of the track, switching up the instrumentation a bit on the second loop of the main melody and adding a couple new sections. It’s hard to put my finger on it, but all of this together give the track a slightly different feel, one that somehow suits moonlit castle corridors more than sunken ruins. While I think the original is my favorite version of Sinking Old Sanctuary, I enjoy the embellishments in this one and think it suits the pace of the game well. This track is tied to a good chunk of the map in CotM, and so you’ll be hearing it a lot as you explore the castle. In that light, a longer loop that does a little more to drive you forward feels like a good fit.